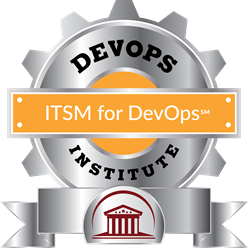 The DevOps Institute (DOI), the Continuous Learning Community around emerging DevOps practices, education and certification, is proud to announce the launch of a new non-certification course: ITSM for DevOps. This course describes how to adapt IT service management (ITSM) processes in support of DevOps. Learners will learn pragmatic approaches for streamlining and automating existing ITSM processes and handling compliance as code. ITSM for DevOps is the second in a series of non-certification “DrillDown” courses offered by the DevOps Institute and is a complement to its line of DevOps Practitioner® certification series. All courses are delivered by DOI’s global channel of Registered Education Partners. The DevOps Institute is actively developing future DrillDown courses. This series of non-certification workshops “drills down” more deeply into a topic or practice. DrillDown courses are very focused and provide more prescriptive guidance and practical experience for the learner. These courses are designed as complementary “plugins” to DOIs existing certification portfolio or as continuous learning opportunities for individuals who may not need to seek additional certification. DOI’s global network of education partners will offer the DrillDown courses as bundles or as stand-alone offerings.